The Cascade Foundation and its trustees, learners, volunteers and Cascade ambassadors would like to thank the Nessy team for their support and the help they’ve given us at the Cascade Health and Learning Hub in Doncaster. Our CEO has been using this software for many years with young children and training providers across the country. The challenge has been to find software to help adults with learning difficulties, such as dyslexia, dyspraxia, head injury and other disabilities. Last year we were running a pilot scheme with Nessy software to see how adults would adapt to this type of learning. 23 adult learners signed up for this and were coming in at a pre-entry level. Many had no idea about their disability, they could not use a computer or read or write and were very low in self-esteem and confidence. Many had suffered depression, social isolation and loneliness by having a disability that was not supported within the community. They ranged from 18 to 65 years of age, and many had been on benefits for most of their lives. We worked on Nessy reading & spelling and Nessy fingers which was chosen to help our learners to touch type. Due to the requirements of Universal Credits, claimants need to research for jobs for 35 hours a week and complete an online job journey. This gives information on how they are applying for work during that week. At the start of these Universal Credits, many of our learners who were unable to either have access or use a computer were being sanctioned, losing their benefit pay. This resulted in increased poverty and led to us fighting many court cases that year. We supplied each of these claimants with a mentor or volunteer to give them one- to-one support to help them fill in these online journeys. Some only managed to type the heading Cascade but reported back to their personal advisor at the job centre how excited they were to log on to the computer and job search for the first time. The Nessy software is fun, taking the fear or negative experiences they may have had with learning when they were young. We found that some of the learners would sit for hours and play with the software, unaware how much they were learning. Reports were carried out weekly on how much time was spent on learning, including reading and spelling. This was a great motivator for the start of every Monday morning for our learners to join in a group discussion and engage with each other. They now feel less alone with their learning disability, sharing their problems with others and knowing that we all share the same DNA. We have just gained a contract with Doncaster MBC, funding from Awards for All lottery, South Yorkshire PCC and Moto services. We are working very closely with our local community Grant Officer from Asda, Caroline Hall, to help us with more resources for our Hub, to support as many learners as we can to have a better understanding of their learning and to help prepare them to progress on into college or employment. Thank you to all the Nessy team for their support and kindness in this community project and helping us to moving lives on! Watch this space to see how many learners take the challenge this year! http://www.thecascadefoundation.org/wp-content/uploads/2019/03/Nessy_Logo_300x300-01-e1553525367792.png 200 200 kirsten http://www.thecascadefoundation.org/wp-content/uploads/2017/10/banner-1.jpg kirsten2019-03-25 14:48:472019-03-25 14:50:16Thank you Nessy! Last autumn we received a wonderful email from Major Stan M Hardy, Deputy Lieutenant, West Yorkshire and we wanted to share it with you. Thanks so much for your support Stan! “Prevention is better than cure is an adage which is almost as old as the hills but no less true for being old. It’s more than a proverb, it’s a principle which should be the hallmark of every legitimate human endeavour and certainly in service planning. It is without doubt the guiding principle of CASCADE and the team which so successfully pursues the aim of giving disadvantaged people a second chance. “It is no co-incidence that 70% of those men and women serving custodial sentences are functionally illiterate – not because they lack intelligence but rather that they have a functional disability such as dyslexia. Having spent their childhood and early youth being dismissed as “thick, stupid and incapable”, they begin to believe it. Their frustration at being excluded and effectively condemned to uselessness creates anxiety and resentment and so frequently a chemical dependency and criminality follows. Hence 70% of offenders in custody also have a mental health challenge and a dependency. A case of the “blinding flash of the obvious” if anyone in authority cared to look. The Commissioner Community Grant Scheme has offered us a fund of £2,500 to train 10 ex-offenders as part of our ‘Cascade Jumpstart into Safer Communities’ project. Literacy where learners have never understood their own learning style, thus not achieving at school. ADHD and those who have suffered life changing head injuries or other physical injuries. Those who have been unable to fit into society through their own personal experiences, leading to loneliness and feeling of isolation. Ex-prisoners who need to be able to return to the community and general lifestyles such as using public transport finding a doctor or dentist surgery. It is our mission to use a new approach to support and educate disengaged ex-offenders and others living within the local community with specific learning difficulties to transform their lives and reduce reoffending. Our project within HMP Doncaster “Dyslexia Behind Bars II”, uncovered a high percentage of prisoners with learning difficulties: 53% had a reading and writing age of four years, 52% of the families of prisoners had learning difficulties and 72% of prisoners had not had a job for many years. Our interview and course ‘Cascade Personal and Social Development for people with learning disabilities’ runs for six weeks. During this time. we provide a multi-sensory approach to teaching using our own developed unique and innovational programs which are delivered to suit each learner’s individual needs using specialist designed IT software. All our learners develop their skills, behaviours and attitudes through direct instruction and added support as necessary which enables learners to learn and grow in self-knowledge, social interaction, physical and emotional health with self-determination through our project-based activities. We improve the numeracy and literacy of learners so that they can become self-sufficient. Evidence from employees such as Marks & Spencer shows that employees recruited from disadvantaged groups demonstrate low turnover rates than the wider workforce. The higher value placed on having a job with the desire to stay out of prison often means ex-offenders have high levels of loyalty and retention. In Doncaster there are four prisons within a 10-mile radius and we found that 75% of employees will not hire these claimants because of their previous convictions. Joe (not his real name) had been volunteering for three days a week for three years with a local charity; their policy was not to employ anex-offender. After nine sessions with Cascade he decided to leave the other charity and is now understanding how dyslexia is stopping people getting their CSCS card. He is also helping in our community café and attending meetings with potential funders. The skills he had developed whilst in prison were overlooked because he was unable to find employment due to his criminal record. Huge thanks to the South Yorkshire Police and Commissioner for funding this project giving 10 ex-prisoners the opportunity to change their lives! Moto in the Community Trust gives us a boost! 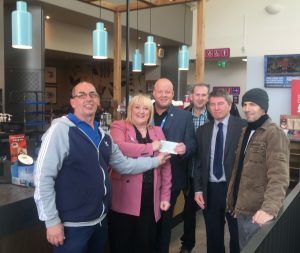 Moto in the Community Trust, the charitable arm of Moto Hospitality, the UK’s leading motorway service area provider, has made a donation of £1,000 to The Cascade Foundation. The donation will enable our Cascade Foundation mentors to teach and support even more learners who have dyslexia, head injury or other learning difficulties and support them into employment or volunteering. Commenting on the donation, Jackie Hewitt-Main OBE, chief executive and founder of The Cascade Foundation said: “I can’t thank the Moto in the Community Trust team enough for this invaluable donation to Cascade. It will help us transform the lives of a wide variety of individuals who come to us for our unique and highly effective method of sensory learning. http://www.thecascadefoundation.org/wp-content/uploads/2018/11/moto-photo.jpg 2047 2431 kirsten http://www.thecascadefoundation.org/wp-content/uploads/2017/10/banner-1.jpg kirsten2018-11-22 10:51:082018-11-22 10:52:25Moto in the Community Trust gives us a boost! The Cascade Community Café is open for business! Our very first community café is now open and providing employment and work experience opportunities for local people with learning disabilities and head injuries. 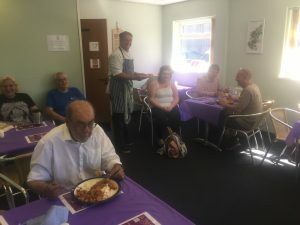 The Cascade Community Café is based at our Health & Learning Hub on Marshgate in Doncaster and is run by experienced chef, Paul Sanderson, and Cascade learners. Following a unprovoked attack whilst walking through Doncaster with his two children two years ago, Paul sustained life-changing head injuries and has not been able to work since. Before the brutal assault, Paul had forged a highly successful career in the catering and hospitality industry. “Ever since we launched the Cascade Health & Learning Hub last summer, we’ve wanted to add a catering element,” explains Jackie Hewitt-Main OBE, founder and chief executive of The Cascade Foundation. The Cascade Community Café is open for breakfast and lunch from 8.30pm to 1.30pm Monday to Friday. Customers can choose from a tasty menu that includes a full English breakfast with two sausages, two slices of bacon, egg, mushrooms, tomatoes, hash browns, beans and toast plus a drink all for just £2.90, jacket potatoes, fresh salads and sandwiches, plus main meals such as meatballs with spaghetti (£2.85) or traditional fish & chips and chicken curry both priced at £3.90. Every dish is created using locally sourced produce. All of the proceeds from food sold in the café is put straight back into the charity to fund other learning projects and help grow other commercial ventures designed to create much needed funds. http://www.thecascadefoundation.org/wp-content/uploads/2018/06/IMG_2363.jpg 2448 3264 kirsten http://www.thecascadefoundation.org/wp-content/uploads/2017/10/banner-1.jpg kirsten2018-06-26 15:13:462018-06-26 15:14:53The Cascade Community Café is open for business! 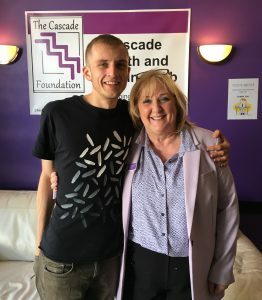 Michael Thompson will never forget the day he met Jackie Hewitt-Main OBE, founder of The Cascade Foundation, during the very first week of his 14-month custodial sentence at HMP Doncaster. The History graduate from Greater Manchester stood out from many of his fellow prisoners with his University education and calm, friendly demeanour. Within five minutes of chatting to Michael about her innovative prison project to teach inmates to read and write, she’d realised his potential and recruited him to start mentoring prisoners under her guidance. By taking on a role of teaching alongside Jackie, Michael was able to apply his own skills to help many others as well as himself. He embarked on a number of training and learning courses, gaining qualifications in Customer Service, Counselling and Business Studies. He also completed a Level 3 ‘Award in Education’ to further improve his teaching proficiency. After his release, Michael did an enterprise course with The Prince’s Trust. He worked hard at his entrepreneurial objective and, with support from his friends in Manchester and Sheffield, he established a social enterprise – Rite Trax – with three of his peers. As well as managing Rite Trax, Michael is a Young Ambassador for The Prince’s Trust and he also volunteers for several local drug and alcohol awareness charities. HRH Duke of York Community Initiative Award! The Cascade Foundation was inaugurated in May 2013 and launched at the House of Commons, Westminster, with a speech by the Right Hon. Secretary of State for Justice Chris Grayling MP. We became a registered charity in September 2013. Our registered charity number is 1154017.